Approximately 80% of HAIR Products tested used by Black Women contain chemicals linked to cancer, infertility, & obesity . When you use AHOSI Beauty Products, you can be sure that the ingredients in our products will not cause you harm. 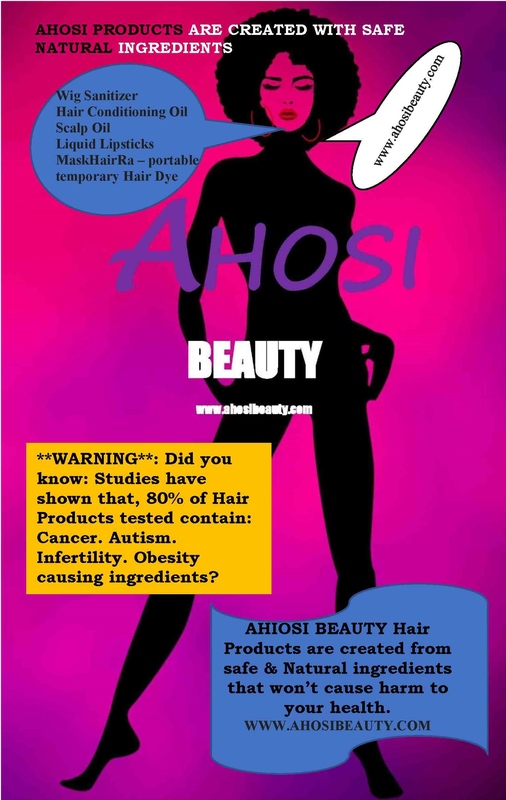 With her strong commitment to safety, the creator of AHOSI BEAUTY PRODUCTS, along with natural hair care ingredients experts created products with natural ingredients to ensure harm is not caused to the user of these products. Our patent pending Wig-Sani is a new product Made in the USA & the UAE. Before you wear a wig, or hair extensions, use our Wig-Sani to sanitize, clean and freshen, remove germs, and any undesirable creatures that may be lurking inside. When your hair is braided, spray our Wig-Sani on the braids to keep them fresh. Spray Wig-Sani on itchy scalp to stop itch. Spray around forehead, neck and behind ears before wearing wigs, to ease discomfort from wearing wigs. Wig-Sani contains natural and safe ingredients which will protect your hair, and scalp. Our products will not cause you harm. DO NOT RINSE OUT! AHOSI HAIR CONDITIONING OIL & AHOSI SCALP STIMULATING OIL will help condition and stimulate hair growth. No mess, no need to rinse. Simply spray all over hair and roots, and style as necessary. For optimal benefits, these two products contain one-part natural oils, and one-part water. Both products contain natural and safe ingredients which will protect your hair and scalp. Is your hair fried, dyed and laid to the side?